I work with my wife Maike, my brother Hubert and his wife Steffi, and together we run a Biohotel, a restaurant, and a bakery on Langeoog, an island in the North Sea. Our main objective is to safeguard the ecosystem of the island, where luckily there is no car traffic. We want to work in an eco-sustainable way and we try to raise awareness among our clients about the importance of making responsible choices. We try as much as possible to oppose industrial agriculture in our business. Our menu is strictly seasonal and the majority of the ingredients we use, from meat to vegetables, come from small-scale local producers. In our small way we are also trying to fight climate change, first and foremost by reducing meat consumption. In order to make a contribution we decided to cook meat dishes at our restaurant only on Saturdays. On all other days we generally don’t use meat, apart from occasionally a small amount of bacon in a traditional recipe. We use all cuts of meat, not just the most common, and we try to avoid any kind of waste. We are feeling the effects of climate change on the island, and the local residents are very aware of the problem. In 2018, together with nine other families, we filed a lawsuit against the European Union for failing to protect citizens against the impacts of climate change. The recipe I’m sharing with you is our flagship Saturday dish, and uses lamb from the White-Horned Heath sheep breed paired with an East Frisian specialty, Updrögt beans. After the harvest, these white beans are threaded into long garlands which are hung up to dry in the attic. 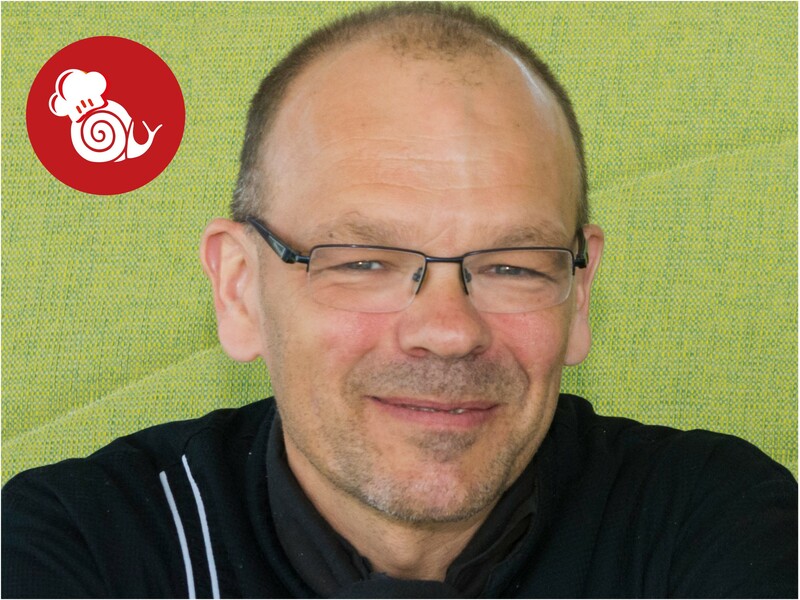 We belong to the Slow Food Chefs’ Alliance because this project reflects our values, strengthens our actions and inspires us to keep following this path. Break the beans into small pieces and soak them in water. Salt the leg of lamb, sauté in pepper, and fry the bone (if there is one) with it. Add roasted vegetables and sauté. Deglaze with red wine, deglaze several times with water, reduce again and again until the water has evaporated and deglaze again, this creates the roasting substances for the sauce. Mix the basic sauce, bay leaf, juniper, clove, garlic and rosemary in a bowl. Bake in the oven at 120°C for about 2-3 hours, regularly turning it over and pouring water over it. Keep meat warm, if necessary add a little water to the sauce if it has reduced too much. Pour the sauce over the meat. Meanwhile, boil the Updrögt beans. Drain and rinse. Remove the rind from the bacon and dice. Dice the onions. Fry the bacon in lard or oil, add onions, beans, bacon rind, fill with vegetable stock and simmer covered for about 90 minutes. Peel and chop the potatoes, after about an hour add to the stock and cook. When everything is soft, remove the bacon rind (these can be used later in other recipes!) lightly mash the mixture and season with salt and pepper if necessary. Put the beans on a plate, cut open the roast, arrange on top of the beans, add the sauce and serve with side dishes. *Basic Sauce: roast beef bones, add roasted vegetables (carrots/celery/porree/onion diced), tomato paste, deglaze several times with red wine and reduce again, fill up with water or a stock (depending on what is there), add spices (rosemary, laurel juniper, cloves), simmer for about 2 hours, strain. You can also add other ingredients such as bacon rind, ‘vegetable waste’ tomato caps or similar.